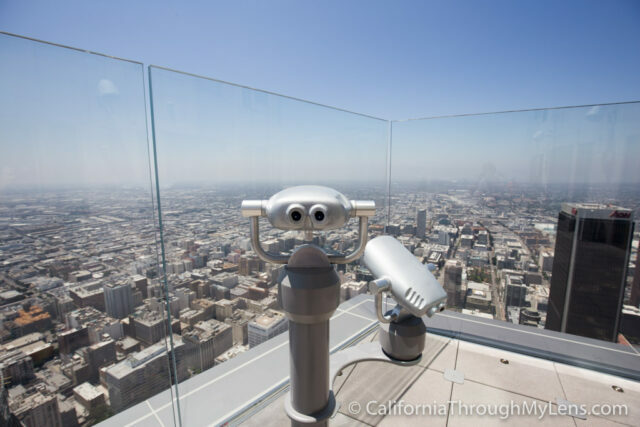 Much like Chicago and New York before it, Los Angeles now has its very own high up observation deck so you can experience the city from above. 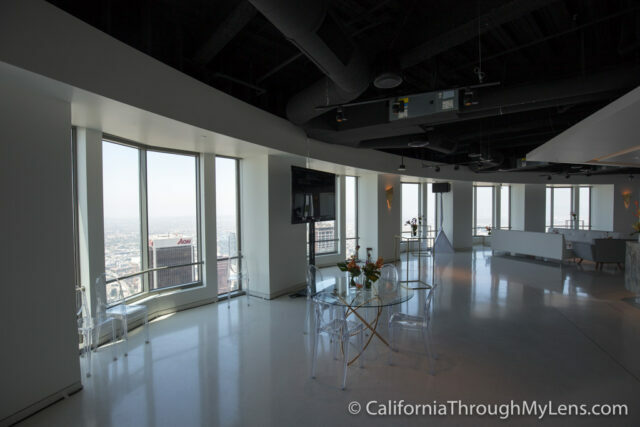 The deck is 70 floors up, and it provides unparalleled views of Los Angeles and the area surrounding it. 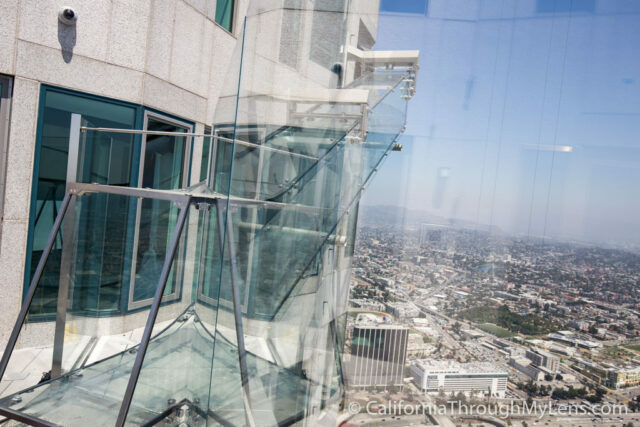 Plus, it also features a new glass slide that takes you from the 70th to the 69th floor. 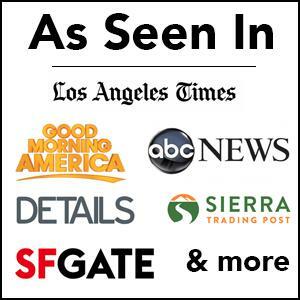 I got a chance to check it out opening weekend, and it was a ton of fun, here is all the information. 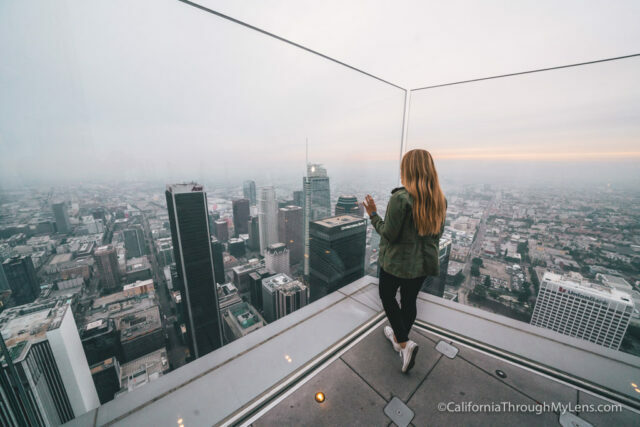 Update Nov 2017 – I visited again, and they now have offer a lot more activities including yoga at sunset twice a month and an interactive experience about the sights and sounds of LA narrated by George Lopez. Here is a highlight video of my time there. Here is another video I made when I went back at the end of 2017. 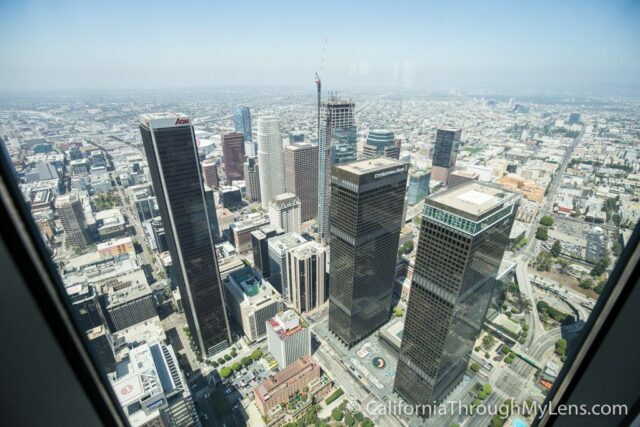 The US Bank building is located right in the middle of downtown Los Angeles. There is a parking structure on Hope St that you can use to visit the building, or there are other parking lots around the area. Parking can be expensive, but that’s a big city for you. 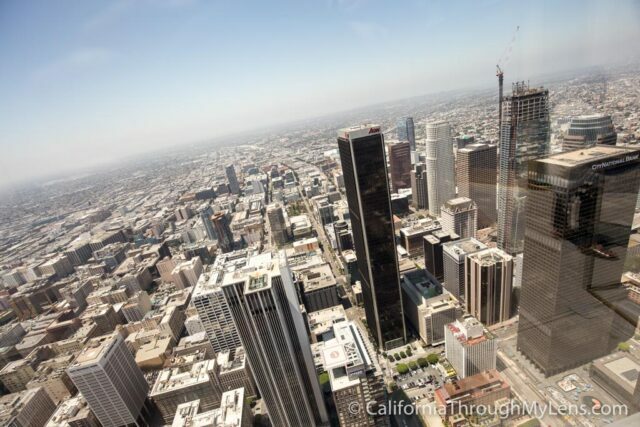 The cheapest parking I have found is at the LA Library where they have an $8 option for two hours if you are visiting Skyspace. 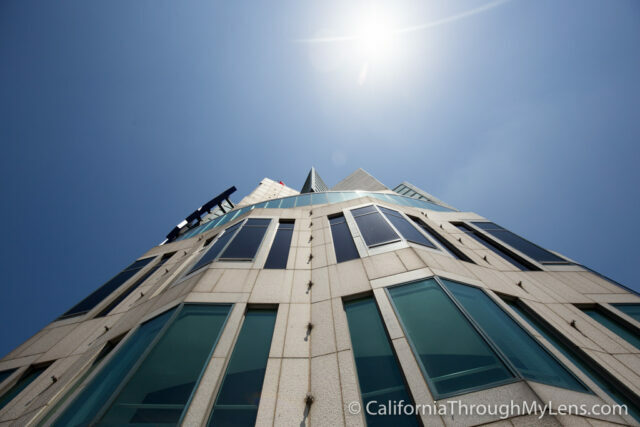 After making your way into the US Bank building, you will be ushered to the elevators and taken to the first of the multiple floors you visit. 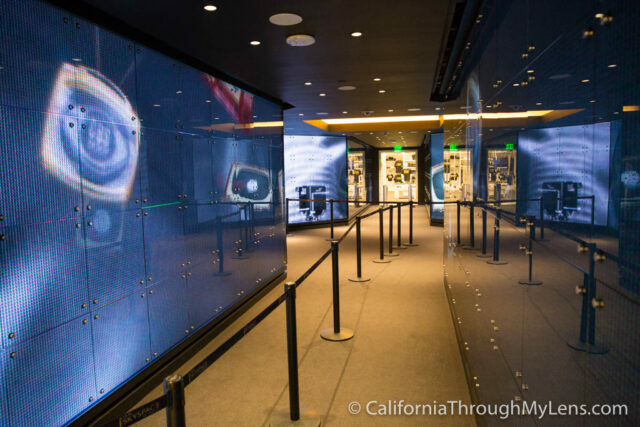 Floor 54 is the first floor you get to, and it has a few different interactive exhibits that you can experience. 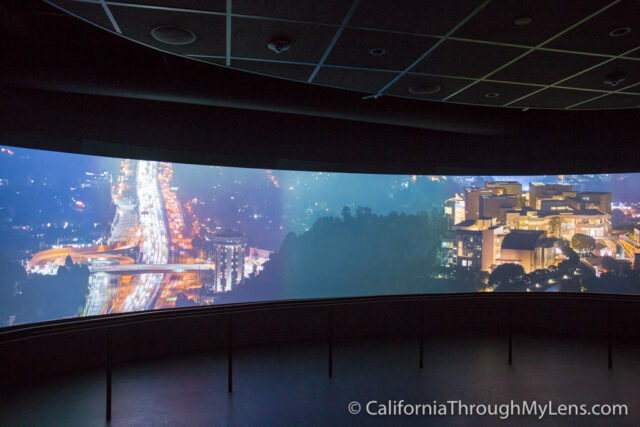 First, there is an almost 360-degree screen that shows various videos of Los Angeles you walk through. 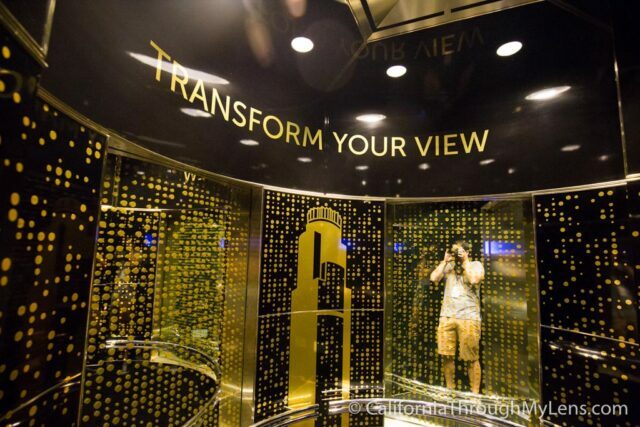 Next, there is an infinity mirror that you can stand on, and that looks like you are going to fall through the building. It was a little creepy but super cool. 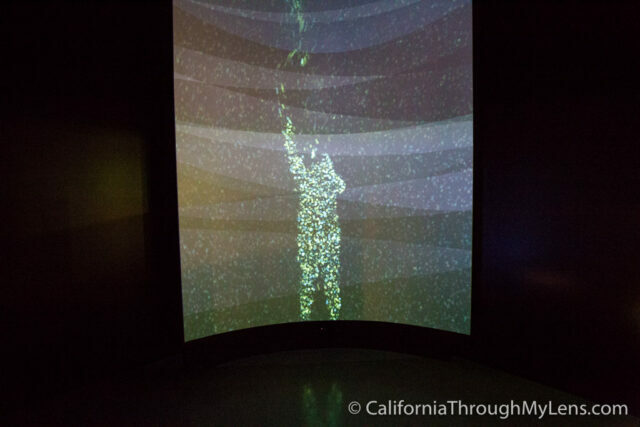 Lastly, there is a massive screen that you interact with by standing on specified areas of the ground and moving around to change your silhouette on the screen. 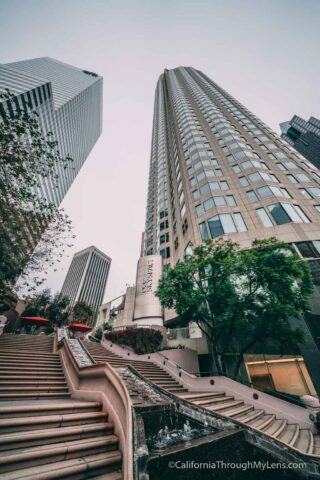 From here you head back to the elevator and up to the 70th floor. 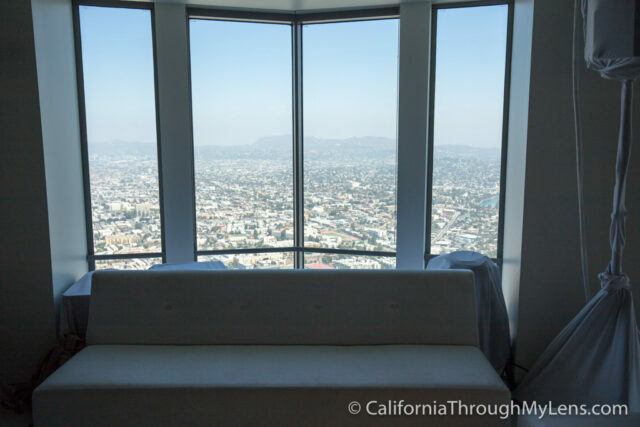 When you exit the elevator on the 70th floor, you will be able to get in line for the slide or just walk around and take in the views. I made a loop around the deck to see the different points of view and was impressed with the clean and beautiful area that you are walking around in. There were chairs and couches to lounge on, a bar where you could buy soft drinks and floor to ceiling windows all over. 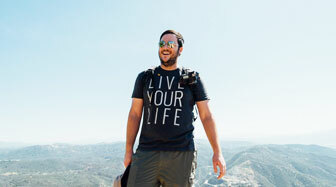 You could see a lot of the famous spots in LA like Dodgers Stadium, Hollywood Sign and Echo Park. Next, I hopped in line for the sky slide. 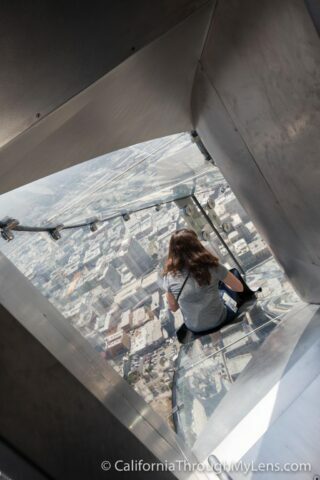 Having been to a few of these observation decks with glass floors in the past, I was really excited about riding the slide, since it was so unique. 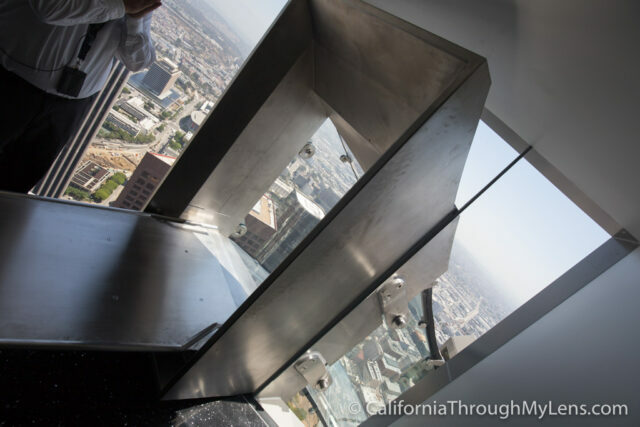 The slide takes you from floor 70 to floor 69 in about 5 seconds, but the entire time you are looking through the glass floor and to the ground below. 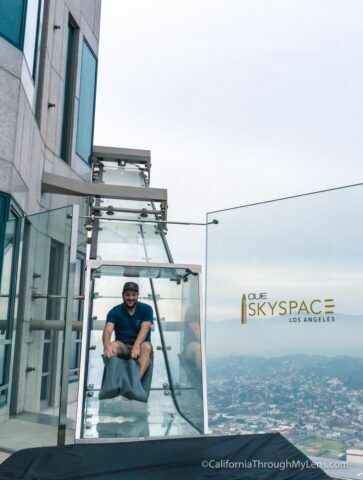 It is a pretty surreal experience as I have never done anything like it, and I thoroughly enjoyed myself even though I am not a huge fan of heights. Sure it is not very long, but when else have you got to do something like this? You go pretty fast, so they have foam pads at the end that you land on when you complete the slide. 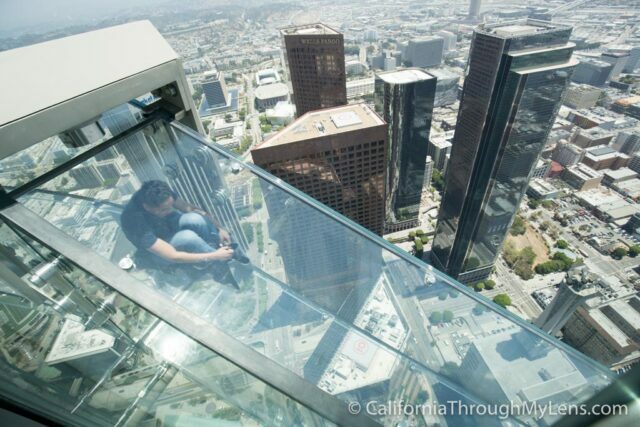 At the bottom of the slide, you will be on the 69th floor, which is the open-air observation deck. This was probably my favorite part of my time there as I enjoyed just being able to sit out on the deck and observe the city below me. It trumps the other deck at city hall as it is at least twice as high. The open-air atmosphere feels very California as it is almost always beautiful weather here, so it makes sense to have it open. 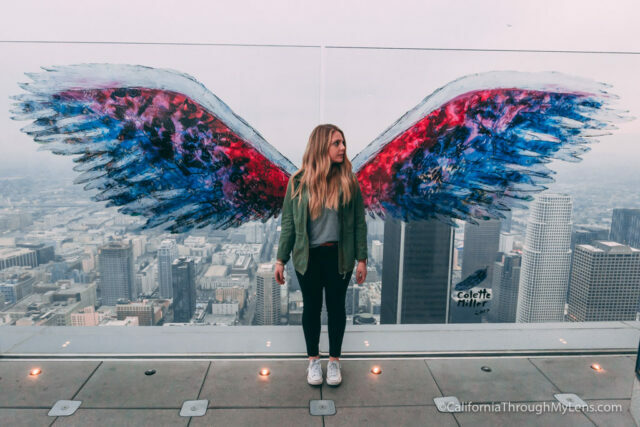 The popular wings that you can see all over Los Angeles make an appearance up here as well and they are a really popular photo spot. There is an additional deck on the opposite side, and this is the best one to watch the sunset from. 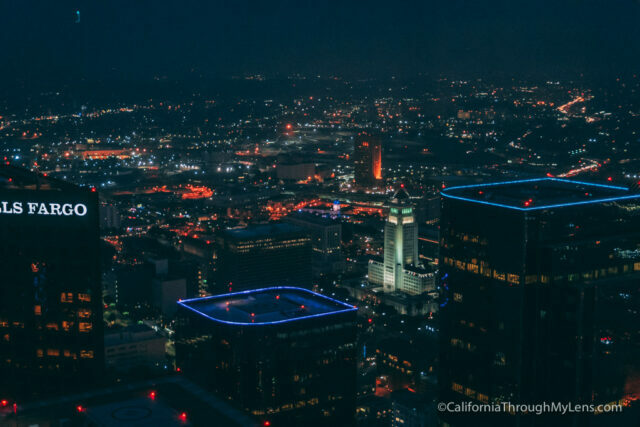 Here you can see the colors change over the city, and all of the lights come on. 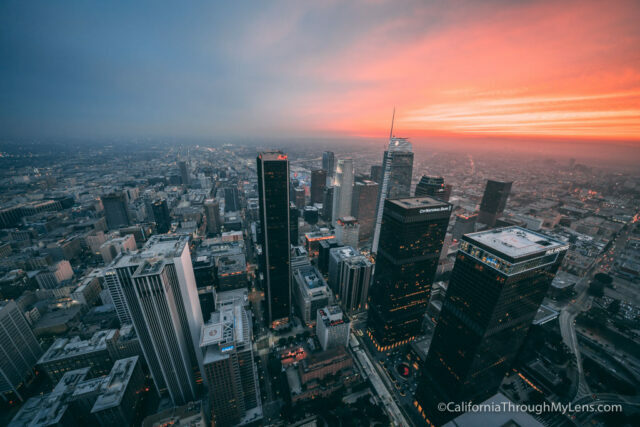 I went up for sunset recently, and it was a lot of fun just to watch it go down and see the city come to life. 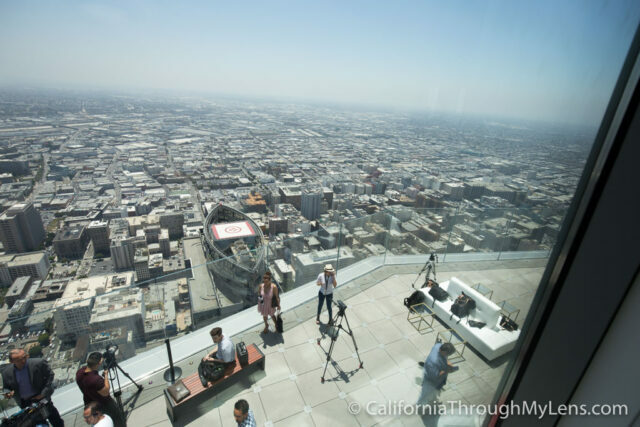 After finishing on the deck, you can head back to the 69th floor and walk around if you would like but it is pretty much identical to the 70th floor in the way it looks. 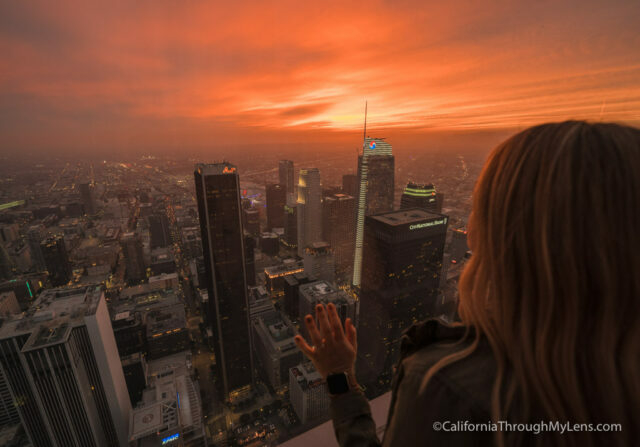 All in all, SkySpace in LA is a unique way to explore the city. 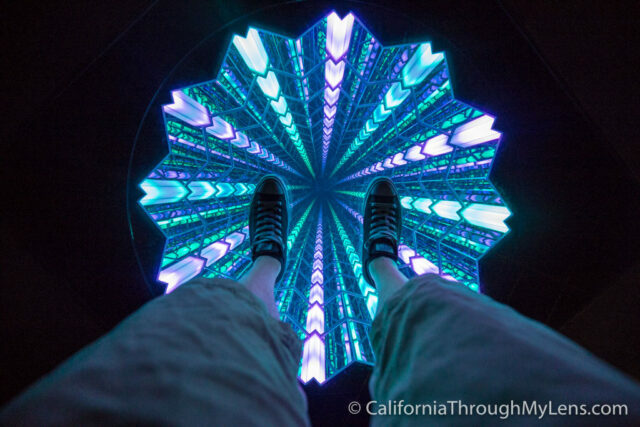 I enjoyed being able to walk around, see the vantage points, interact with the exhibits and ride the slide. Be sure to check it out if you are in downtown and let me know what you think in the comments.